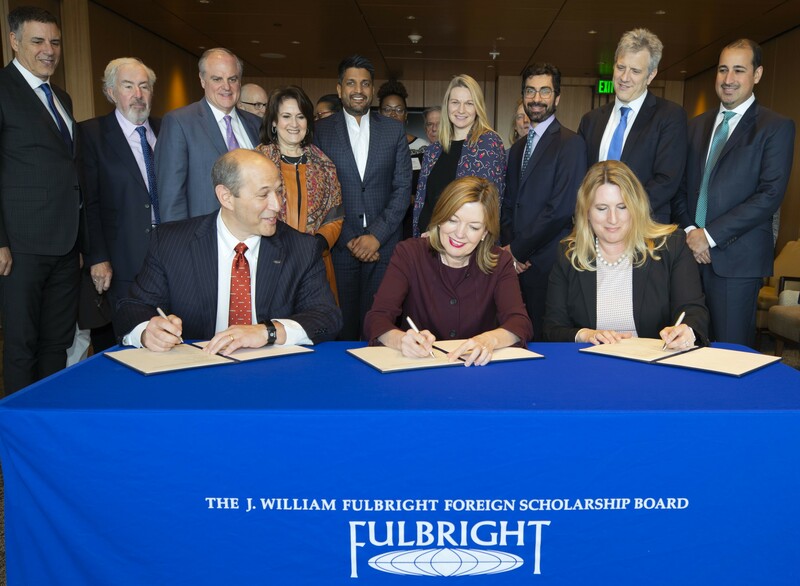 The agreement aims to increase the number of Fulbright participants to and from the Smithsonian Institution, to enhance the U.S. Department of State’s ongoing efforts to diversify the pool of Fulbright applicants and participants, to increase the number of Fulbright-producing and Fulbright-hosting institutions, to deepen engagement with Fulbright Program alumni, and to increase institutional partnerships for the Fulbright program. The agreement is in furtherance of the 2012 Memorandum of Understanding between the Department of State and the Smithsonian, and builds on many years of cooperation during which the Smithsonian and State Department have worked together to develop programs that advance shared goals, including hosting visiting Fulbright research scholars at the Smithsonian. In recent years, the Fulbright Commissions in Ireland and the United Kingdom have established joint research programs in partnership with the Smithsonian. The new agreement represents the further development of ongoing collaboration to build capacity among international museum professionals, to protect cultural heritage, and to promote mutual goals to expand cultural and scientific exchange. Established by the U.S. Congress in 1946, the U.S. Department of State’s Fulbright Program is the U.S. government’s flagship international academic exchange program, designed to increase mutual understanding between people of the United States and people of other countries. The Fulbright Program annually supports more than 8,000 students, scholars, artists, and professionals from the United States and more than 160 countries to study, teach, conduct research, exchange ideas, and find solutions to shared international challenges. Established through a bequest from British scientist James Smithson, the U.S. Senate passed the act organizing the Smithsonian Institution in 1846. The Smithsonian advances its core mission of “the increase and diffusion of knowledge” through its 19 museums, 12 research centers, seven education and outreach centers and the National Zoo that collectively work in more than 140 countries around the world. This new agreement supports the ongoing efforts of the Smithsonian to employ its unique strengths to engage and inspire people, wherever they are, while catalyzing critical conversations on issues affecting our nation and the world. The Smithsonian’s goals include driving visionary interdisciplinary research, creating new forums to proffer solutions to problems of national and global import, and magnifying its national and global reach through new collaborative approaches and strategic partnerships.